You know how college basketball is…team from smaller conference plays at bigger-conference team’s arena…home team plays highlight-reel ball for a half, trades baskets in the second half and you get a 15-point win that wasn’t really as close as the score indicates. That was last night’s game. The Mavs have been on both ends of that situation, and last night it was our turn to destroy a smaller, less-skilled opponent in our home arena. With about 12:00 left in first half, UTA was already up 17-2 and would lead at halftime 39-19. Or, for an unstatistical observation: the Mavs were just really on their game offensively and defensively the first half last night. The first 20:00 would have beaten most WAC teams easily. 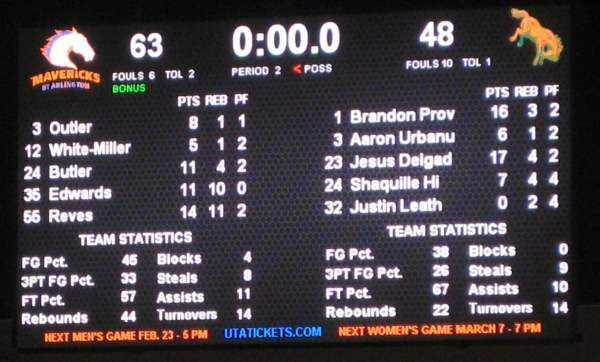 UTPA’s tallest player was 6-7 so Jordan and Brandon were able to get a ton of rebounds and putbacks. In my mind, Brandon might be the best dunker we’ve seen at UTA in awhile (although who can forget that one that Stuart dropped on Texas State last year at CPC–look it up on YouTube) and Brandon had another good one last night. Picked up the ball off the floor under the basket and slammed it home. At one point, if the scoreboard was correct, I think we had like a 23-3 rebounding lead in the first half. After UTA got out to a big lead, the last 5 minutes of the first half or so looked very UTA vs. Texas State-like, with a lot of fast breaks, quick shots and overall just fun to watch. For most of the second half, the teams more or less traded baskets. UTA was patient on offense, find the open guy and take the open shot. And when smaller teams can’t get inside or down by a large margin (or both in this case), they often hoist a lot of 3s and UTPA didn’t make many of them (6 of 23). But to UTPA’s credit, they played hard all game and when UTA’s intensity waned a little in the second half, managed to outscore us 29-24 in the final 20:00. I won’t be able to attend that game due to a prior family commitment, but if anyone wants to do a “guest” game report for this site, post it in the comments and I’ll promote it to a game story. This entry was posted in Basketball, College Park Center, Dunks, Mavericks, UT Arlington, UTA, Win and tagged College Park Center, CPC, ut arlington, UTA by rustyhancock. Bookmark the permalink.